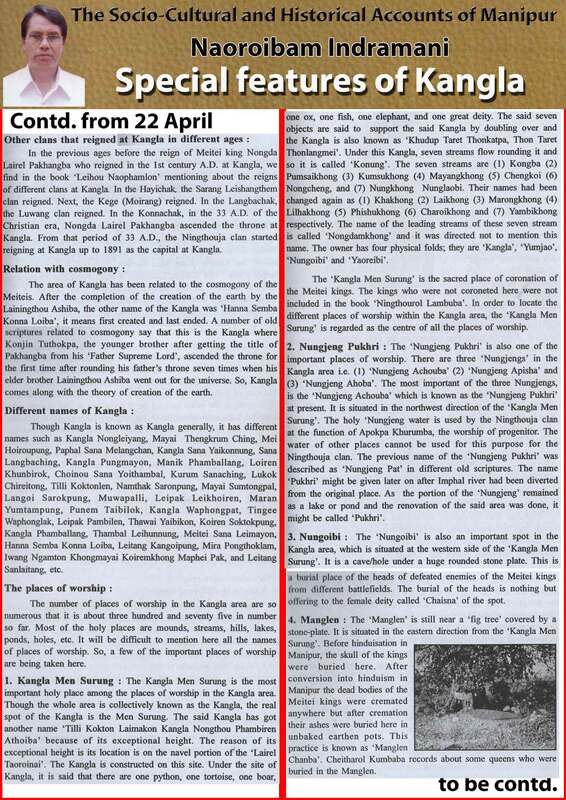 In the previous ages before the reign of Meitei king Nongda Lairel Pakhangba who reigned in the 1st century A.D. at Kangla, we find in the book “Leihou Naophamlon” mentioning about the reigns clan reigned. Next, the Kege (Moirang) reigned. In the Langbachak, the Luwang clan reigned. In the Konnachak, in the 33 A.D. of the Christian era, Nongda Lairen Pakhangba ascended the throne at Kangla. From that period of 33 A.D., the Ningthouja clan started reigning at Kangla up to 1891 as the Capiral at Kangla.